Not far from where I live is a hill that was cut into by the moving water of a creek. Eroded this way, all that’s left of it is a broken wall of earth that contains old roots and pebbles woven together and exposed. Seen from a distance, it is only a rise of raw earth. But up close it is something wonderful, a small cliff dwelling that looks almost as intricate and well-made as those the Anasazi left behind when they vanished mysteriously centuries ago. This hill is a place that could be the starry skies of night turned inward into the thousand round holes where solitary bees have lived and died. It is a hill of tunneling rooms. At the mouths of some of the excavations, half-circles of clay beetle out like awnings shading a doorway. It is earth that was turned to clay in the mouths of the bees and spit out as they mined deeper into their dwelling places. This place where the bees reside is at an angle safe from rain. It faces the southern sun. It is a warm and intelligent architecture of memory, learned by whatever memory lives in the blood. Many of the holes still contain the gold husks of dead bees, their faces dry and gone, their flat eyes gazing out from death’s land toward the other uninhabited half of the hill that is across the creek from these catacombs. The first time I found the residence of the bees, it was dusty summer. The sun was hot and land was the dry color of rust. Now and then a car rumbled along the dirt road and dust rose up behind it before settling back down on older dust. In the silence, the bees made a soft droning hum. They were alive then, and working the hill, going out and returning with pollen, in and out through the holes, back and forth between daylight and the cooler, darker regions of inner earth. They were flying an invisible map through air, a map charted by landmarks, the slant of light, and a circling story they told one another about the direction of food held inside the center of yellow flowers. Sitting in the hot sun, watching the small bees fly in and out around the hill, hearing the summer birds, the light breeze, I felt right in the world. I belonged there. I thought of my own dwelling places, those real and those imagined. Once I lives in a town called Manitou, which means Great Spirit, and where hot mineral spring water gurgled beneath the streets and rose up into open wells. I felt safe there. With the underground movement of water and heat a constant reminder of other life, of what lives beneath us, it seemed to be the center of the world. A few years after that, I wanted silence. My daydreams were full of places I longed to be, shelters and solitudes. I wanted a room apart from others, a hidden cabin to rest in. I wanted to be in a redwood forest with trees so tall the owls called out in the daytime. I daydreamed of living in a vapor cave a few hours away from here. Underground, warm, and moist, I thought it would be the perfect world for staying out of cold winter, for escaping the noise of living. And how often I’ve wanted to escape to a wilderness where a human hand has not been in everything. But those were only dreams of peace, of comfort, of a nest inside stone or woods, a sanctuary where a dream or life wouldn’t be invaded. Years ago, in the next canyon west of here, there was a man who followed one of those dreams and moved into a cave that could only be reached by climbing down a rope. For years he lived there in comfort, like a troglodyte. The inner weather was stable, never too hot, too cold, too wet, or too dry. But then he felt lonely. His utopia needed a woman. He went to town until he found a wife. For a while after the marriage, his wife climbed down the rope along with him, but before long she didn’t want the mice scurrying about I the cave, or the untidy bats that wanted to hang from stones of the ceiling. So they built a door. Because of the closed entryway, the temperature changed. They had to put in heat. Then the inner moisture of earth warped the door, so they had to have air conditioning, and after that the earth wanted to go about life in its own way and it didn’t give in to the people. In other days and places, people paid more attention to the strong-headed will of earth. Once homes were built of wood that had been felled from a single region in a forest. That way, it was thought, the house would hold together more harmoniously, and the family of walls would not fall or lend themselves to the unhappiness or arguments of the inhabitants. An Italian emigrant to Chicago, Aldo Piacenzi, built birdhouses that were dwellings of harmony and peace. They were the incredible spired shapes of cathedrals in Italy. They housed not only the birds, but his memories, his own past. He painted them the watery blue of his Mediterranean, the wild rose of flowers in a summer field. Inside them was straw and the droppings of lives that layed eggs, fledglings who grew there. What places to inhabit, the bright and sunny birdhouses in dreary alleyways of the city. One beautiful afternoon, cool and moist, with the kind of yellow light that falls on earth in these arid regions, I waited for barn swallows to return from their daily work of food-gathering. Inside the tunnel where they lives, hundreds of swallows had mixed their saliva with mud and clay, much like the solitary bees, and formed nests that were perfect as a potter’s bowl. At five in the evening, they returned all at once, a dark, flying shadow. Despite their enormous numbers and the crowding together of nests, they didn’t pause for even a moment before entering the nests, nor did they crowd one another. Instantly they vanished into the nests. The tunnel went silent. It held no outward signs of life. But I knew they were there, filled with the fire of living. And what a marriage of elements was in those nests. Not only mud’s earth and water, the fire of sun and dry air, but even the elements contained one another. The bodies of prophets and crazy men were broken down in that soil. I’ve noticed often how when a house is abandoned, it begins to sag. Without a tenant, it has no need to go on. If it were a person, we’d say it is depressed or lonely. The roof settles in, the paint cracks, the walls and floorboards warp and slope downward in their own natural ways, telling us that life must stay in everything as the world whirls and tilts and moves through boundless space. One summer day, cleaning up after long-eared owls where I work at the birds-of-prey rehabilitation facility, I was raking the gravel floor of a flight cage. Down on the ground, something looked like it was moving. I bent over to look into the pile of bones and pellets I’d just raked together. There, close to the ground, were two fetal mice. They were new to the planet, pink and hairless. They were so tenderly young. Their faces had swollen blue-veined eyes. They were nestled in a mound of feathers, soft as velvet, each one curled up smaller than an infant’s ear, listening to the first sounds of earth. But the ants were biting them. They turned in agony, unable to pull away, not yet having the arms or legs to move, but feeling, twisting away from, the pain of the bites. I was horrified to see them bitten out of life that way. I dipped them in water, as if to take away the sting, and let the ants fall in the bucket. Then I held the tiny mice in the palm of my hand. Some of the ants were drowning in the water. I was trading one life for another, exchanging the lives of ants for those of mice, but I hated their suffering, and hated even more than they had not yet grown to a life, and already they inhabited the miserable world of pain. Death and life feed each other. I know that. Inside these rooms where birds are healed, there are other lives besides those of mice. There are fine gray globes the wasps have woven together, the white cocoons of spiders in a corner, the downward tunneling ant hills. All these dwellings are inside one small walled space, but I think most about the mice. Sometimes the downy nests fall out of the walls where their mothers have placed them out of the way of their enemies. When one of the nests falls, they are so well-made and soft, woven mostly from the chest feathers of birds. Sometimes the leg of a small quail holds the nest together like a slender cornerstone with dry, bent claws. The mice have adapted to life in the presence of their enemies, adapted to living in the thin wall between beak and beak, claw and claw. They move their nests often as if a new rafter or wall will protect them from the inevitable fate of all our returns home to the deeper, wider nest of earth that houses us all. One August at Zia Pueblo during the corn dance I noticed tourists picking up shards of all the old pottery that had been made and broken there. The residents of Zia know not to take the bowls and pots left behind by the older ones. They know that the fragments of those earlier lives need to be smoothed back to earth, but younger nations, travelers from continents across the world who have come to inhabit this land have little of their own to grow on. The pieces of earth that were formed into bowls, even on their way home to dust, provide the new people a lifeline to an unknown land, helps them remember that they live in the old nest of earth. It was early February, during the mating season of the great horned owls. It was dusk, and I hiked up the back of a mountain to where I’d heard the owls a year before. I wanted to hear them again, the voices so tender, so deep, like a memory of comfort. I was halfway up the trail when I found a soft, round nest. It had fallen from one of the bare-branched trees. It was a delicate nest, woven together of feathers, sage, and strands of wild grass. Holding it in my hand in the rosy twilight, I noticed that a blue thread was entwined with the other gatherings there. I pulled at the thread a little, and then I recognized it. It was a thread from one of my skirts. It was blue cotton. It was the unmistakable color and shape of a pattern I knew. I liked it, that a thread of my life was in an abandoned nest, one that had held eggs and new life. I took the nest home. At home, I held it to the light and looked more closely. There, to my surprise, nestled into the gray-green sage, was a gnarl of black hair. It was also unmistakable. It was my daughter’s hair, cleaned from a brush and picked up out in the sun beneath the maple tree, or the pit cherry where birds eat from the overladen, fertile branches until only the seeds remain on the trees. I didn’t know what kind of nest it was, or who had lived there. It didn’t matter. I thought of the remnants of our lives carried up the hill that way and turned into shelter. That night, resting inside the walls of our home, the world outside weighed so heavily against the thin wood of the house. The sloped roof was the only thing between us and the universe. Everything outside of our wooden boundaries seemed so large. Filled with the night’s citizens, it all came alive. The world opened in the thickets of the dark. The wild grapes would soon ripen on the vines. The burrowing ones were emerging. Horned owls sat in treetops. Mice scurried here and there. Skunks, fox, the slow and holy porcupine were all passing by this way. The young of the solitary bees were feeding on pollen in the dark. The whole world was a nest on its humble tilt, in the maze of the universe, holding us. This essay appeared in Indiana Review 14.1, Winter 1990. Anna Cabe (Web Editor): In considered, searching prose, Hogan examines the idea of home, from the tiniest nest to the whole Earth. Home is safety, warmth; for a few minutes, reading this essay, I feel like I’m nestled in it. 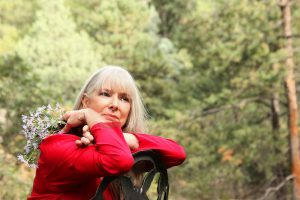 Linda Hogan (Chickasaw), Former Faculty at the Indian Arts Institute, Writer in Residence for the Chickasaw Nation, and Professor Emerita from the University of Colorado, is an internationally recognized public speaker and writer of poetry, fiction, and essays. In July 2014, DARK. SWEET. New and Selected Poems was published by Coffee House Press. Her other newest books are Indios, Rounding the Human Corners, and the novel People of the Whale. Her novel, Mean Spirit, was a 1991 finalist for the Pulitzer Prize. Additionally, her work has earned her such prizes, grants, and fellowships as the Colorado Book Award, the Minnesota State Arts Board Grant, the American Book Award, the Lannan Fellowship, the National Endowment for the Arts Fellowship, the Guggenheim Fellowship and the Lifetime Achievement Award from the Native Writers Circle of the Americas. Hogan was inducted into the Chickasaw Nation Hall of Fame in 2007.